Earlier this evening my wife Soraya and I decided to take the kids out for a ride on our bikes. It’s been a while since we rode together so I was really looking forward to it. 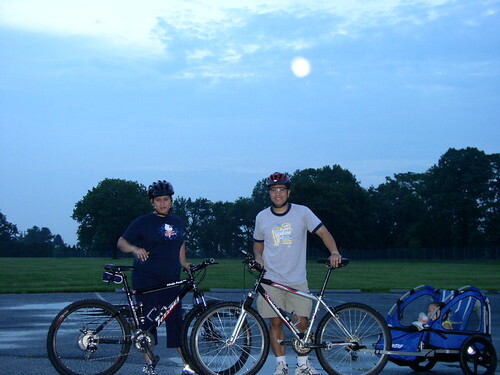 What better way to have a cheap and fun night out with the family than riding your bikes? I believe that times like this makes a family closer. We both had so much fun; we plan on riding as a family more often. That’s awesome! Dude, that seat post is super high! Bicycling is such an idyllic way to conduct family outings; we are fortunate to live in a place small enough that most everything we do is by bicycle. The errands and adventures I treasure most are when all three of us are together, two in the saddle and one in tow. If we were to use the car for, say, a quick trip to the ice cream store, it would just be home, ice cream, home. Instead, we enjoy home, a stop at the mulberry tree, a visit with the horses in their pasture, ice cream, a juant on the bike path, and maybe home again unless something else interesting gives us pause. That sort of serendipity isn’t near as likely in a car. However, I hope I can offer one piece of advice without giving offense: that is, I wouldn’t put my little girl in her trailer without buttoning down the protective screen. Out on the trail, I’ve had mountain bike tires throw stones big enough to dent a frame. While road debris usually isn’t so large, and knobbies usually aren’t so stout on a town bike, tires still kick up rocks, dust, broken glass, bottle caps, cigarette butts, and whatever other detritus people can’t keep in their damn cars for some reason (excuse my bitter bias, but why is it people with so much space are so likely to chuck stuff by the roadside?). Anyway, thanks for sharing, and I wish you many happy family rides. Thanks for sharing that with us Ron. The protective screen you talked about is down because of the short intermission we had. We had to give the girls their bottles. Since we were stopped, a Kodak moment presented itself. I would never dream of puting my kids onto harms way. But I do thank you for your concern.